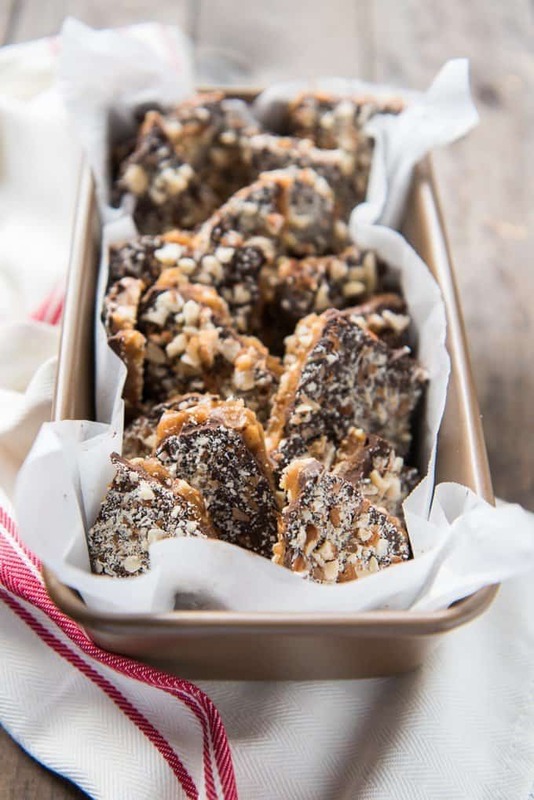 Grandma Nash’s Best Butter Almond English Toffee recipe is one to be handed down through generations. 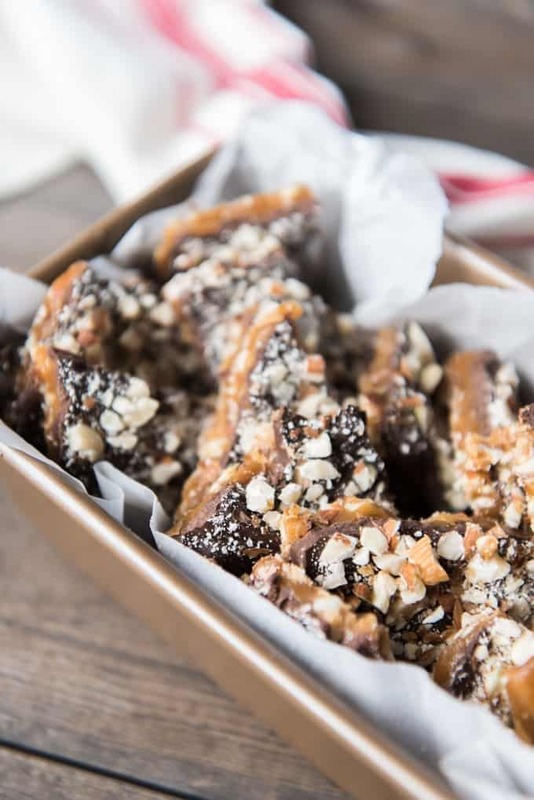 The crunchy, buttery toffee and toasted almonds with a thick layer of chocolate makes this one of our favorite candies and a Christmas tradition that we love to share with friends & neighbors! 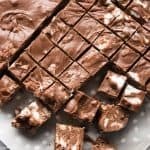 For the past few years, I have made 8 or more batches of this fabulous butter almond English toffee to go on plates of goodies (along with this Rocky Road Fudge) that we take around to friends and neighbors in our area, along with Christmas cards. And I always make a batch to be lovingly packaged up and shipped off to Paul’s grandma (our girls’ great-grandma), from whom this recipe comes. She is in her 90’s now and no longer makes her famous toffee herself, so I have taken over making it for her and making sure she has a supply to share with her friends who come to visit during December. This toffee always reminds us of Grandma Nash, along with her creamy apricot pork chops and poppy seed dressing. 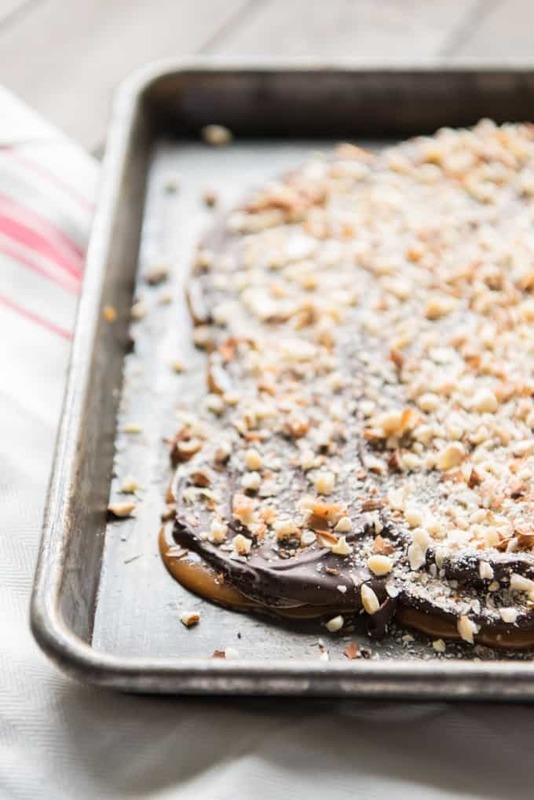 Even though you could technically make this butter almond english toffee recipe without a candy thermometer, I highly recommend investing in a good one. They aren’t too expensive and it’s a great stocking stuffer for anyone who might like to cook but hasn’t done much candy-making! And it almost makes toffee-making a foolproof endeavor since all you have to do is get the toffee up to the right temperature. Paul’s Grandma Madge clipped the recipe for this Butter Almond English Toffee from the San Jose Mercury Newspaper in 1962 and she made multiple batches of it every year after that. Her toffee is famous in the Nash family, so one Christmas a few years back I asked her if I could get a copy of her recipe so that I could learn to make it since we don’t live close by and Paul always raved about her toffee. 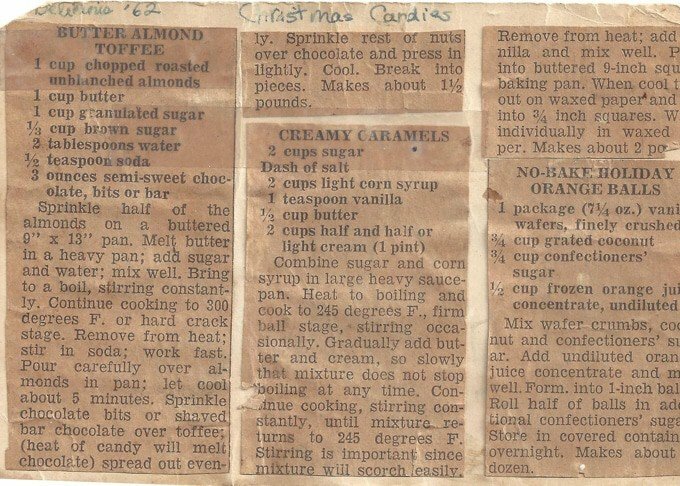 She pulled out a box of recipe cards and had the original newspaper clipping taped to a card with her handwritten notations “Delicious ’62” and “Christmas Candies” over the top, along with recipes for “Creamy Caramels” and “No-Bake Holiday Orange Balls”. I haven’t tried either of the other two recipes from those newspaper clippings, but can attest to this “Butter Almond Toffee” being particularly delicious. The only change I have made is to double the amount of chocolate called for in the original recipe. And I can’t imagine who is going to complain about an adjustment like that. I also rewrote the instructions a bit to include some steps that I have found helpful. Grandma Nash is such a wonderful, interesting lady. She goes by her middle name, Madge, instead of Gwendolyn, which is her first name. My dad does the same thing so when our Rose was born, we decided to do the same for her and have her go by her middle name as a nod to each of them. I have used a large pot and quadrupled the recipe with great success, since I usually make between 8-12 batches. I still divide the chocolate and almond into separate bowls, and pour the toffee out into individual baking sheets to set, but I cook all four batches at the same time with no problem. First, toast whole almonds in a 350 degree oven by spreading them in a single layer on a baking sheet and roasting for 10 to 15 minutes. Chop the cooled almonds into small pieces and set aside. Butter a baking sheet and sprinkle with half of the chopped almonds. Melt the butter in a heavy-bottomed pan, then add sugar and water, stirring to combine using a long-handled wooden spoon and bringing to a boil over medium-high heat until a candy thermometer reaches 300 degrees (hard crack stage), usually between 10-15 minutes. Remove the candy from the heat and immediately stir in the baking soda. 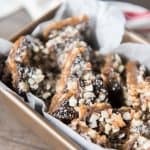 Immediately pour the hot candy over the almonds in the prepared baking sheet and spread out into a thin layer; then sprinkle with chopped chocolate. The heat of the toffee will melt the chocolate which you can then spread out evenly with the back of spatula or knife. Sprinkle the remaining chopped almonds over the melted chocolate. Let the toffee cool completely and the chocolate re-harden and set, before breaking the toffee pieces. Yes, I’m serious, this really is the BEST. I know it’s a bold claim, but I think it’s the addition of the baking soda which changes the texture just enough to make it really truly amazing. You want to make sure that this butter almond English toffee is completely set before breaking it into pieces. I find that it is easiest to let the toffee set overnight, then use a butter knife to jab firmly down into the toffee, which cracks apart into scrumptious buttery, chocolatey, almond covered shards. While the recipe calls for semisweet chocolate, I have used milk chocolate in the past instead and it is also delicious. Totally go with whatever is your personal preference. I’m so glad to have this cherished butter almond English toffee recipe in my collection, along with my mom’s Chicken Cordon Bleu and my aunt Becky’s Black Forest Cake. I’m sure your family will love it as much as ours does! 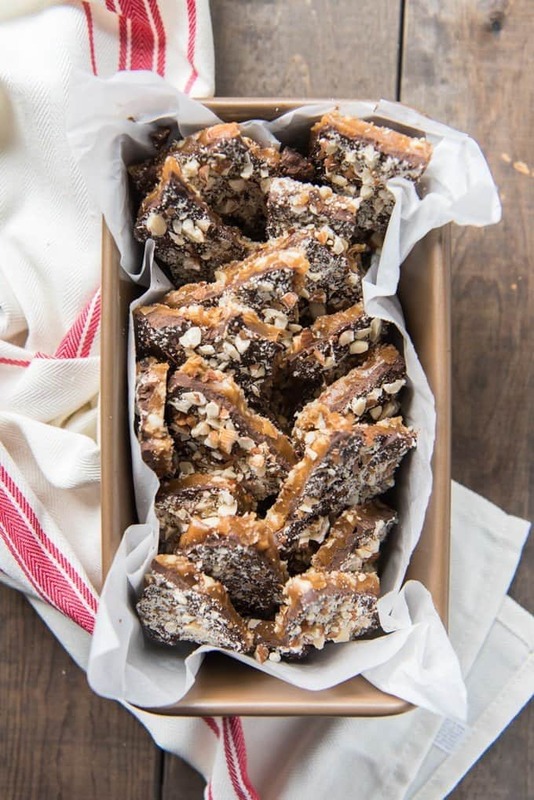 Grandma Nash's Best Butter Almond English Toffee is one to be handed down through generations. The crunchy, buttery toffee and toasted almonds with a thick layer of chocolate makes this one of our favorite candies and a Christmas tradition that we love to share with friends & neighbors! To toast the almonds, preheat oven to 350 degrees. Spread whole almonds in a single layer on a baking sheet and roast 10-15 minutes, until fragrant and toasted, but being careful not to burn them. Let cool, then chop into small pieces and set aside. Butter a baking sheet or silipat mat, then sprinkle half of the chopped almonds on the buttered surface and set aside. In a heavy pan over medium-high heat, melt the butter, then add both types of sugar and the water. Stir to combine using a long-handled wooden spoon and bring to a boil over medium-high heat, stirring constantly. Continue stirring until a candy thermometer reaches 300 degrees (hard crack stage), usually between 10-15 minutes. Remove from heat and immediately stir in the baking soda, working quickly. The toffee will bubble and foam a bit when reacting to the baking soda. 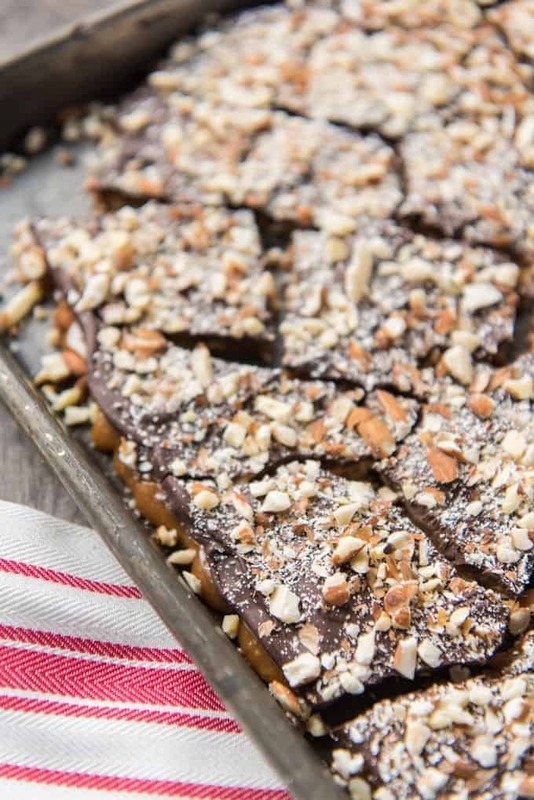 Immediately pour the hot candy over the almonds in the prepared baking sheet and spread out into a thin layer with the back of your stirring spoon; let cool slightly for 2-3 minutes before sprinkling the chopped chocolate over the toffee. The heat of the candy will melt the chocolate after just a few minutes and then you can spread it out into an even layer with the back of spatula or knife. Sprinkle the remaining chopped almonds over the melted chocolate and press down lightly with the back of a clean spoon. Let the toffee cool completely and the chocolate re-harden and set, then break into pieces. Chocolate chips work just fine if you don't have a bar of semi-sweet chocolate. 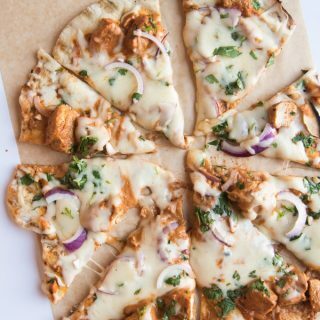 Looks so delish, would love to try it! Yummy Toffee! I love it! Can’t wait to try it. Aw, thanks, Elizabeth. You are so sweet! Merry Christmas and a happy New Year to you as well! I love this and can not wait to try this!!! I LOVE toffee and yours sounds and looks absolutely scrumptious!! I’ll have to try the recipe! I love how Grandma Nash still had the original recipe stashed away. How sweet! This recipe looks perfect. This looks like something a Purdy’s…but grandma’s recipe would be better for sure. Happy Holidays!! Sounds addictive!! I love toffee! This recipe sounds amazing. I hope you have a great holiday season! Grandma Nash is a brilliant cook! This sounds absolutely divine. Happy Christmas! Grandma Nash sure sounds like a hoot to be around. I be she appreciates that you keep her supply of this beautiful toffee stocked every year. And how fantastic is that old newspaper clipping???. . . a true testament to just how delicious this toffee is. 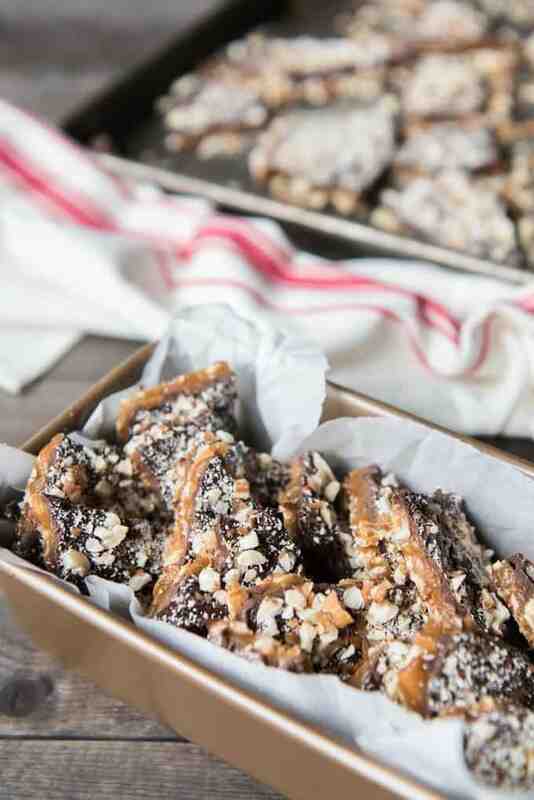 Making toffee around the holidays is so much fun, and it makes the perfect gift. This looks wonderful. Family recipes are the BEST! Love making and gifting toffee! This looks scrumptious!! Made my first batch tonight!!! A few notes for those who move too quickly… Don’t buy pre roasted almonds. Also don’t try to do the toffee while you “warm up” said pre roasted almonds lol. I was running back and forth trying to chop up the warmed almonds and stir the toffee. Haha attempt #2 will happen tomorrow! Love that you made it, Chelsea! Yeah, once that toffee starts boiling it’s hard to do anything else! 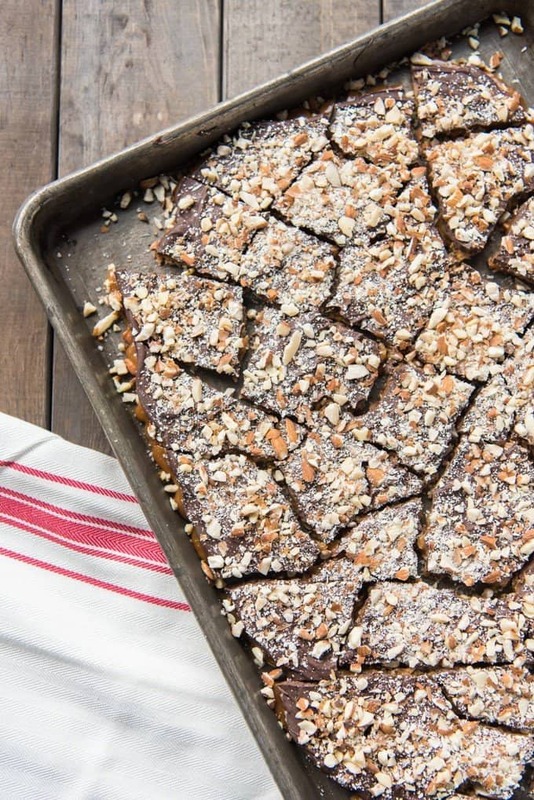 Gorgeous looking toffee, I love how you keep the family traditions alive! Brittle is so delicious, it also reminds me of my grandma. Will golden brown sugar work as well as dark brown sugar? Yes, it should. The flavor won’t be quite as strong since light brown sugar doesn’t have as much molasses as dark brown sugar, but it’s close enough that I doubt you would ever notice. 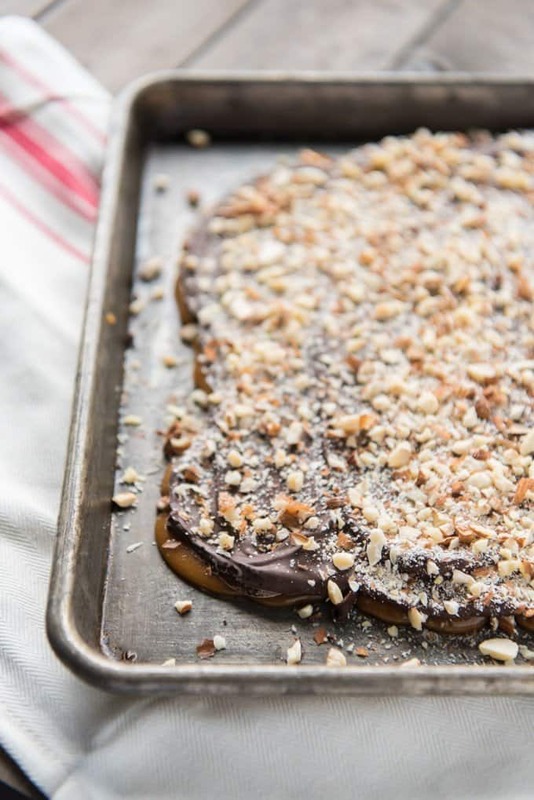 Adding baking soda makes for an even better toffee texture. Just made this toffee for my mother, Agnes Ellertson Schwaar. She is a cousin to Madge, or as I knew her, Aunt Madge. I was talking to mom about growing up in Mona, and all her gang of friends including Madge. After hanging up I found this on Pinterest so I knew I had to make it. Thank you so, so much for this sweet, special comment! I had to forward it on to my mother-in-law so she could read it. 🙂 We miss Grandma Nash! just made this and i did it just like i was supposed to. the candy separated and turned back to butter. what went wrong? Oh no! Candy can be tricky but my guess is that it is one of two things – either not cooking it to the right temperature or not stirring enough. It takes almost constant stirring to get the butter to combine with all the other ingredients and stay that way. Next time you make candy / toffee, add 3 T of corn syrup. It keeps the butter mixed in. My toffee recipe that is a little bit different than yours, (no brown sugar, water or baking soda), goes from boiling away looking like what I call “marshmellowy”, and then the oil separates out from the candy. But, if you keep stirring and cooking the toffee, the oil blends back into the candy and it turns a nice caramel color and then you pour it out. So, you may not have cooked it quite long enough! Haven’t tried your recipe, but I’m going to! It looks wonderful!! I just love English Toffee! Loved this recipe but I will do it with milk chocolate next time. I just made this and it was my first time attempting toffee! I used toasted walnuts because it was what I had on hand, also added some pretzels to my bottom layer of nuts, and used milk chocolate because thats what I had on hand. Its so good! I am so glad I found your recipe! 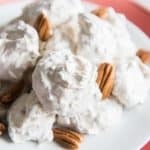 The addition of baking soda is what sets it apart from all of the other recipes I looked at, gives it an easier bite in my opinion! We LOVED IT! This will be the only toffee recipe I ever use! I’m so glad you enjoyed this toffee! 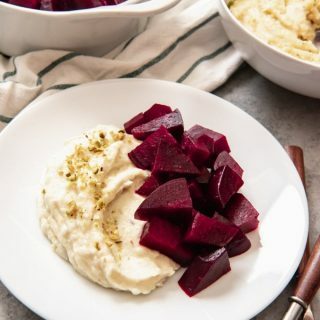 It’s such a special recipe to us because it came from my husband’s grandma and we feel like it is the best too! Approximately what size do you spread the mixture in the pan? Will definately try! I just use a regular size baking sheet like I use for cookies. This stuff is amazing. I could eat the whole thing myself! And, it makes such a pretty treat for holiday gifts! Thanks for the recipe! I haven’t made the recipe yet but I fully intend to this week. The reason I’m writing is because I was very touched by your description of Madge. So much so that when I read she had passed, I cried. She sounds like a wonderful, fun-living gal. Thank you for introducing me to her. She was quite an amazing lady. I’m glad I was able to share a little bit of what she was like with this recipe. I love the yellowed newspaper clippings and food memories are the best. This buttery toffee looks absolutely amazing! Hi, does it matter if I use salted or unsalted butter? 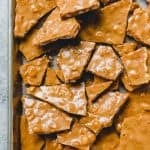 I vowed that is would never make another almond toffee recipe again because, of all the disastrous results I’ve had over the years, until I saw Grandma Nash’s recipe. 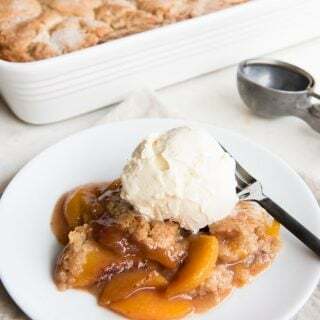 I used my trusty cast iron skillet, candy thermometer, wooden spoon, prepared all the ingredients, read the entire recipe, helpful hints, and I was ready to go–Delicious! I cooked it LOW and SLOW–didn’t have any butter separation-just wonderful almond toffee gift giving. Thank you! I’m SO glad that you not only tried the recipe, Eileen, but that you left this comment and review. This was pretty much how my candy making experiences had gone until Grandma Nash shared her toffee recipe with me as well! Thanks for sharing. I got a chuckle seeing the newspaper recipe…I live in San Jose, and was born in 1962, the year this recipe was published in my local papeso it seemed meant for me! I made it last night, and am so happy with the results I will be making more tonight. It’s super easy to make, just be sure to have your pan greased and nuts chopped before you start. I used pre-roasted almonds from Whole Foods, and Cadbury milk chocolate, since I prefer that for toffee, and it was truly delicious. That is kismet! I’m so glad you like this recipe. I made this twice last Christmas, and not only was it easy, it was so delicious. I call it Christmas crack. I am about to make more tonight! Lol – I’m so glad you like it! AMAZING is all I can say AMAZING! Our office received some Enstrom Almond Toffee as one of the many corporate goodies that arrive over the holidays. I never tasted this type of almond toffee before and was super impressed. However, Enstrom isn’t available in Canada. Undaunted I combed the interwebs looking for a recipe clone. After narrowing it down to only a few I started to research the differences of which there are few. The biggest difference seems to be in the addition of baking soda at the last minute (or not). My wife and I gave it a try and instantly made two double batches, much of which was shared as gifts. This is an absolutely amazing recipe and while I can’t say whether its the best in the world or not, I have never tasted better! This has instantly become a Christmas tradition for our family. Thank you for sharing. You are welcome! And thank you for such a thoughtful comment! We love giving this as gifts too.